Something's cooking...! - Lunch, dinner? So, what's cooking at your place? We're going to be creative together, so you better have your creative materials ready! Show us what you had for your lunch or dinner - in colours!! 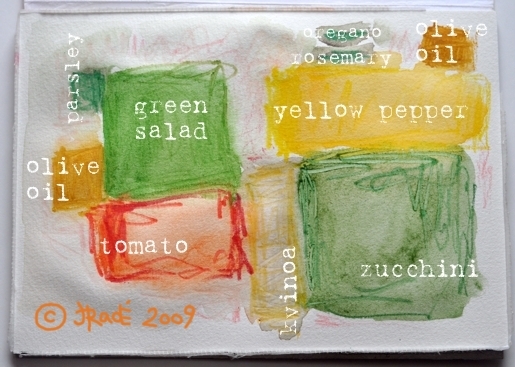 No photographs of your real lunch, only colours. You should organise them according to the portions you had. Enjoy creative process, and I hope to see your creations soon! (You can share them directly or send us a link). And by the way, enjoy your meal! Copyright © 2010-2011, Jožica Rade aka Creatissimo, All rights reserved / Vse pravice pridržane!